The latest, and perhaps last, David Attenborough TV series is the two episode First Life: about the very earliest life on earth. It ends as the first life emerges from the sea. David Attenborough is a hero in our household: Mrs SomeBeans and I saw his “Life on Earth” series at an impressionable age; he is our matchmaker, were it not for “Life on Earth” Mrs SomeBeans would not have gone to university to study zoology, which is where she met me – at university, not as a zoology specimen, I hasten to add! The good thing about a David Attenborough nature programme, is that they are rich enough that even someone who had done a degree in zoology will actually learn quite a lot of stuff. Attenborough’s autobiography, Life on Air , is also well worth a read – perhaps the most striking thing is the realisation that someone still alive was involved in creating the TV documentary format. Returning to “First Life”: the programme starts with Charnia a fossil identified in Charnwood Forest – close to where Attenborough grew up, it was the first fossil found in Precambrian rocks, dating to at least 580million years ago, which had previously been thought devoid of life. As a time yardstick: the earth is about 4billion years old and the dinosaurs flourished between 230million and 65 million years ago. Charnia looks like a simple frond, it lived in the sea. It is distinct from the later fossils found in the Precambrian and has no modern relatives – in this sense it was a dead-end for life. Following the Charnwood Forest fossils (examples of which are found around the world) the program turns to two further earlier fossil collections at Mistaken Point in Canada and in the Ediacara Hills in Australia. These data from a slightly later period. The Ediacara fossils were the first such collection of fossils found, whilst those at Mistaken Point are the most diverse. As fossils they are fairly subtle marks in the rocks, the creatures from which they derived were soft-bodied – it’s surprising the range of conclusions the experts come to on such markings: inferring early reproduction and feeding strategies. The second episode focussed largely on the fossils found in the Burgess Shale, in the Canadian Rockies, I’ve written about them previously. The key point is that the Burgess Shale assemblage dating to about 500million years ago, exhibits an enormous range of forms – more diverse than seen now, many of which have subsequently become extinct. The fossilisation conditions of the Burgess Shale mean that the soft parts, rather than just the hard parts of the animals are preserved. Seeing them on film there are several striking things: the Burgess Shale quarry is tiny, perched half way up a steep scree slope and the fossils are smaller than I had thought most only two or three centimetres long and very subtle – thin film like fossils only visible in the rock from certain angles. In contrast the fossil trilobites from the Atlas Mountains in Morocco were outright awesome (not a word I use often or lightly). They’re beautifully detailed, and in full 3D including all manner of weird, delicate bristles and appendages Stacks of pictures of the trilobites can be found using the appropriate Google Search. That looks a bit of a dry description, they really are flippin’ fantastic fossils. I’d never realised such fossils existed! The fossil below is from a species which became extinct 400 million years ago – the trilobites became extinct 250 million years ago. 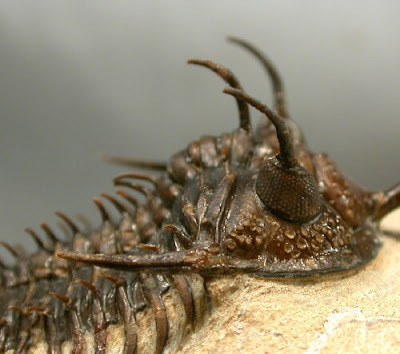 Apparently the eyes of the trilobite are made from calcite lenses – unlike any modern animal. This is interesting because calcite is birefringent so the eyes could potentially have given trilobites polarisation sensitive vision. It implies a high degree of control of the crystallisation of the mineral. Along with the trilobites, sizeable sea scorpions (eurypterid) were found – some up to 2.5metres in length (see here) – this is 1950’s b-movie sized arthropod! First Life is a nice little series about something deeply interesting: how the very first life looked and is nicely executed with location work, expert contributions from real experts and computer graphics visualisations of the living creatures derived from the often badly squashed and indistinct fossils. I wish it had been longer! Thanks to a fellow tweep I have put Richard Fortey’s “Trilobite: Eye Witness to Evolution” on my reading list. David Attenborough is a hero in many many households. Fascinating – particularly, to an eye researcher, the bit about the calcite lenses. Attenborough really is a remarkable example of his species. That was a great blog – and thanks for the links. I, too, thought the trilobite fossils were spectacular. Given the way convergent evolution operates, I wonder why no later species developed the ability to biosynthesise calcite lenses, if they did confer some advantage to do with birefringence. Perhaps that's an argument that they didn't…? @Greg thanks! Funnily enough I know a relative of David Bellamy – they have a family feud. @StephenMoss @SimonHiggins yes, I'm hoping the Fortey book will throw some light on the subject (). As you say fact it doesn't arise again suggests maybe it isn't a great way of doing it. Interesting to know how good control of crystal growth was though.